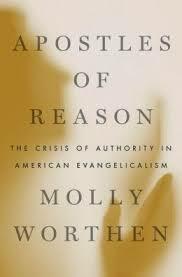 As I mentioned in the last several posts, I’ve been reading Molly Worthen’s wonderful history of the modern evangelical movement, Apostles of Reason: The Crisis of Authority in American Evangelicalism. A number of colleagues have been commenting chapter by chapter, but I was drawn to some broad themes that cut across her history. These themes remain very timely when it comes to thinking about what evangelicalism will look like over the next twenty years. As I worked through the book, there were five threads I kept running across: 1) the convergence of American exceptionalism and evangelical thought, 2) the diversity of thought sitting right underneath an apparent consensus, 3) the importance of infrastructure, 4) the simultaneous pull of legitimacy and separatism, and 5) the effectiveness of simple arguments over complex ones. Without a firm defense of biblical inerrancy, [NAE president Harold] Ockenga predicted, America would fall to enemies within and without, as had imperial Rome. Western civilization was sick with secularism and socialism, the spores that had overrun their hosts in the Soviet Union (26). The linkage of a “biblical worldview” that leads to conservative political stances is somewhat hard to figure. While one might argue that inerrancy could hold sway in moral discussions, such a straight endorsement of the nation-state is surprising. What struck me was that the conservative political leaning of neo-evangelicals was not a result of the Moral Majority or the political maneuvering of Karl Rove. It seems to be a natural affinity between a particular view of a threatening outside world and a desire for protection against that threat. The Christian Reconstructionist movement that originated in the late 1960s seemed to draw form John Birchers and defeated Goldwater supporters. A new view of faith was needed to struggle against LBJ’s Great Society. The same sentiment gives rise to a pragmatic partnership with Catholics over social issues like abortion and homosexuality. The countervailing tendency seems to occur as missionaries learn about cultural embeddedness and Global Christians in the late 20th century express syncretistic approaches to religion (it’s always easier to see culture conflated with religion in somebody else’s culture!). 2. We’re not all like that: This was one of the real surprises for me. When I was at Point Loma Nazarene University, I became enamored with H. Orton Wiley who was president twice. He wrote a definitive theology for the Church of the Nazarene and served as editor the denominational magazine for several years. Wiley gets great praise in Worthen’s book as an intellectual voice that did not follow the script of the neo-evangelical worldview and inerrancy arguments. So do Nazarenes Timothy Smith and Mildred Wynkoop. In addition to their voices, we can add the voices of the Anabaptists (primarily in John Howard Yoder) and the Restorationist churches. Underneath what looks like a monolithic movement of evangelicals, there were and are many voices saying, “Wait a minute. Let’s look at this differently.” That critique continues in a number of quarters, Jim Wallis and Ron Sider, the 1970s Young Evangelicals, the rise of Pentecostalism, and others. It seems to me that most of these alternative voices were speaking within their own communities ABOUT neo-evangelicals but not contesting the position in a larger debate. Perhaps they ceded the label “evangelical” to others (I had such a debate when I celebrated the Nazarenes joining the NAE and was told that “we were Holiness people”). Some of the same ceding is happening today (“if that’s what it means, I don’t want it”). But if we focus on the multiple strands of voicing, we find that evangelicalism is far more complex and more robust than one might otherwise think. 3. The Organization: From the outset, control over institutions was important. The story of Fuller Seminary is particularly interesting as it began as staunchly conservative but shifted its position over the course of the book. But construction of publications (like Christianity Today) and ministries and educational institutions was crucial. There were certain institutions deemed “right” and the network of mentors, mentees, and fellow-students aligns with the best social network analysis. In the 1960s and 1970s, new organizations are created. The 1980s sees conservatives take over Southern Baptist organizations and the rise of publishing empires. Celebrity voices use radio, television, and mass publication to create an impression of dominance in the public eye. These become the focal point for secular media coverage. It was particularly striking to read of the moderates during the Baptist fights. They really didn’t pay attention to issues of political power. I might even say that they thought too highly of the motivations of their opponents. Moderates don’t organize well. We want to hear others’ voices. We recognize complexity (more below) and seem to like nuance. Instead, those conservative organizations focus on maintaining consistent message and leveraging the power of public acclamation. The current crop of moderate writers/bloggers may have great conferences but don’t yet have the strength of infrastructure present among the conservatives. There’s work to do on that front. 4. You Like Me, You Really Like Me: This trend can also been seen at many points along the evangelicals’ journey. On the one hand, the focus on presuppositionalism and worldview means that there is a continual attempt to separate from the secular, socialist, modernist, views of the popular culture. “Our ways are different from their ways.” At the same time, there is a desire for legitimacy through having schools accredited, having scholars recognized, having evidence tested by modernist strategies. Throughout the book, Worthen returns to this tendency of evangelicals to use enlightenment rhetorical strategies in ways that their biblicism won’t quite allow. This theme connects back to the linkage to politics as evangelicals (especially in the Iowa caucuses) desire to shape elections while fighting culture wars. 5. It’s Simple, Really: This theme is especially evident in the chapter on folks like Francis Shaeffer, Tim LaHaye, Hal Lindsey, James Dobson, and others. Arguments are made that oversimplify the case, that caricature alternative views, that hyperbolize isolated situations, that lack context, or that don’t hold up to informed critique (maybe that’s why many evangelicals like Fox News). This rhetorical style, while effective, isn’t informative and may do harm in the long run. I’m reminded of some research from social psychology about attitude change: strong source characteristics trump weak message until doubt sets in; then there’s nothing the source can do to regain influence. This is what Putnam and Campbell called the second aftershock, where the overreach of evangelical celebrities pushed people away. I think this is also consistent with the negative views millennials have toward contemporary evangelicalism. They know that they live in a complex world and expect their organizations and leaders to speak accordingly. I highly recommend this book. For anyone trying to understand how evangelicalism got where it is today, or more importantly, what its future holds, it’s full of clear and helpful insights. I know I’ll return to these themes as I continue my own work. Well done, Molly! Thanks for the energy you put into your posts, John. It’s always helpful. At any rate, I’ll keep reading. I believe that by better understanding evangelicalism as a whole, we can better understand the struggles of individual congregations and of the individuals within those congregations. Let’s keep the dialog alive. I think her thesis is that what we think of as evangelicalism was structured by a fairly small number of people who didn’t reflect all of evangelicalism. Additionally, the very processes that led to evangelical growth weakened the position of those neo-evangelical founders and brought about the modernist accommodation we see today. Your comment about charts and diagrams is an interesting one. My facetious answer is that the history gods don’t let historians write like that. She really does a great job with narrative and lays breadcrumbs that she picks up effectively along the way. The new idea for me in the book is that the critiques being raised by millennials and the emergent church and others have really been around from the very beginning of evangelical institutionalization. Thanks, John. That’s why I have to keep reading. Great reflections on an important book, John. Thanks!